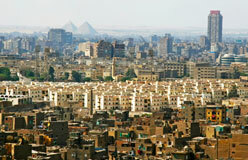 Egypt’s pyramids are the world’s oldest stone buildings. They were built nearly 5,000 years ago. These ancient tombs are also among the world’s largest structures. The biggest is taller than a 40-story building, and it covers an area greater than 10 football fields. Men built these huge structures with the tools they had. 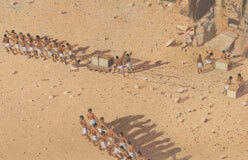 They didn’t have the powerful equipment we have today, such as cranes and bulldozers. Sometimes up to 100,000 men worked for 20 seasons on one pyramid. 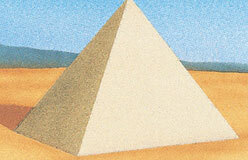 More than 80 pyramids still stand today. Inside their once-smooth white limestone surfaces, there are secret passageways, hidden rooms, ramps, bridges, and shafts. Most had concealed entrances and false doors. What fun it would be to explore one! However, the pyramids were not built for exploring. They served a very serious purpose. 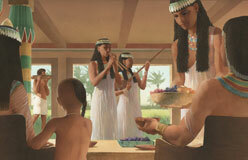 Ancient Egyptians had a strong belief in life after death. The kings, called pharaohs, wanted their bodies to last forever, so they had pyramids built to protect their bodies after death. 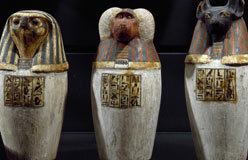 Each pyramid housed a pharaoh’s preserved body. It also held the goods he would need in the next life to continue living as he had when he was alive. 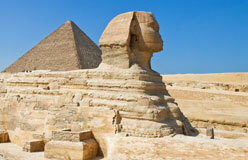 The pyramids of Egypt are massive monuments to the pharaohs’ power. Today they are reminders of a resourceful and creative ancient civilization.